Mixed greens, salami, pepperoni, pepponcini, tomato, red onions, provolone cheese, and our homemade Italian dressing. Mixed greens, cashews, dried cherries, red onions, tomato, served with raspberry vinaigrette. Romaine, Parmesan cheese, tomatoes, croutons, and Caesar dressing. Mixed greens, feta, pepperoncini, tomatoes, red onions, and kalamata olives. Mixed greens, spicy chicken breast, crumbled bleu cheese, red onion, and vine ripened tomatoes. Served with bleu cheese dressing. Vine ripened tomatoes, seedless cucumbers, red onions, green peppers, kalamata olives, and feta cheese served with our house Italian dressing. Vine Ripened tomatoes with fresh mozzarella, extra virgin olive oil, aged balsamic vinegar reduction, and fresh basil. Garlic and herb French bread, over roasted with parmesan cheese, topped with a medley of vine ripened tomatoes, Italian herbs, and roasted garlic. Italian herb breaded, fried crispy and served with marinara. Chunks of chicken breast blended into a mixture of cream cheese and hot sauce. Served in a homemade bread bowl with tortilla chips. A unique blend of spinach, artichoke hearts, vine ripened tomato, herb seasoning, and cream cheese. 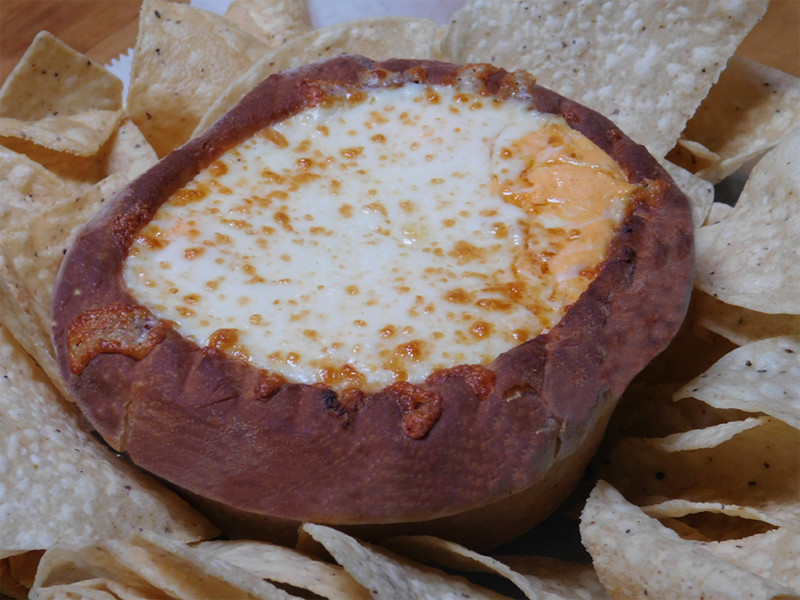 Topped with a melted blend of three cheeses, served in a homemade bread bowl. Stuffed with house made sausage, feta cheese, and bread crumbs. Baked in a garlic and herb butter sauce. With or without cheese, served with marinara.